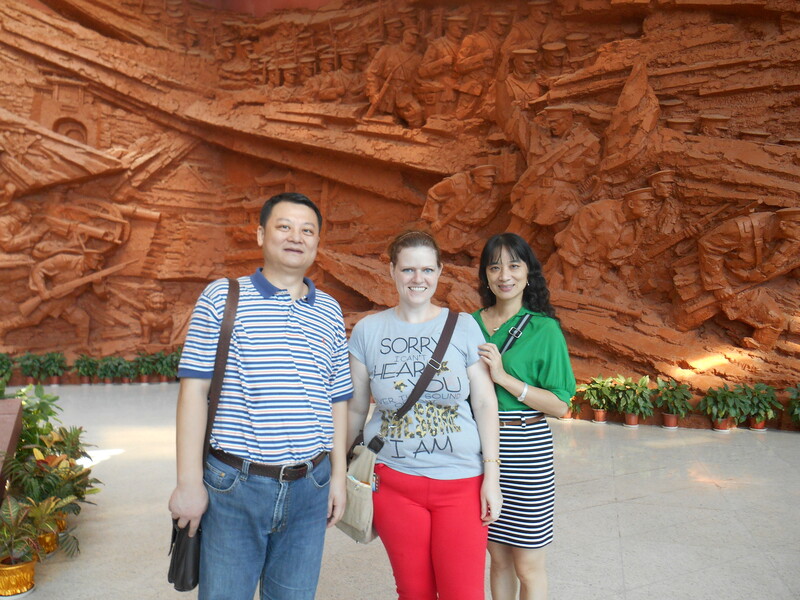 Yesterday was Mid-Autumn Festival and to celebrate my friend ZouYan and her husband took me sight-seeing. 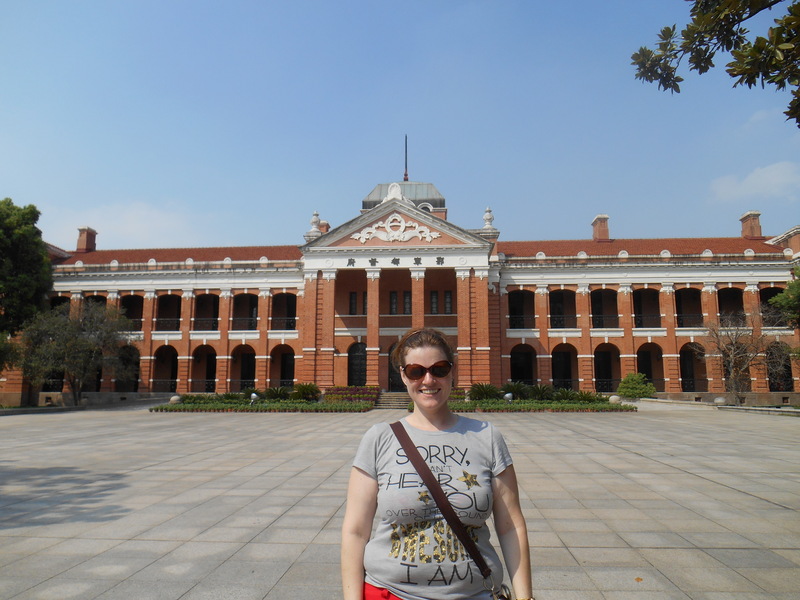 I had so much fun seeing downtown Wuhan. The first stop was the Revolutionary Museum of 1911. The museum covered the fall of the Quing Dynesty and monarchical system of the Emperor and the set up of the People’s Republic of China. I even got a few postcards for the folks back home. The next stop was the “Red Building” where central government was originally set up after the establishment of the People’s Republic in 1911 following the end of the Quing Dynasty. This is a very famous historic site. 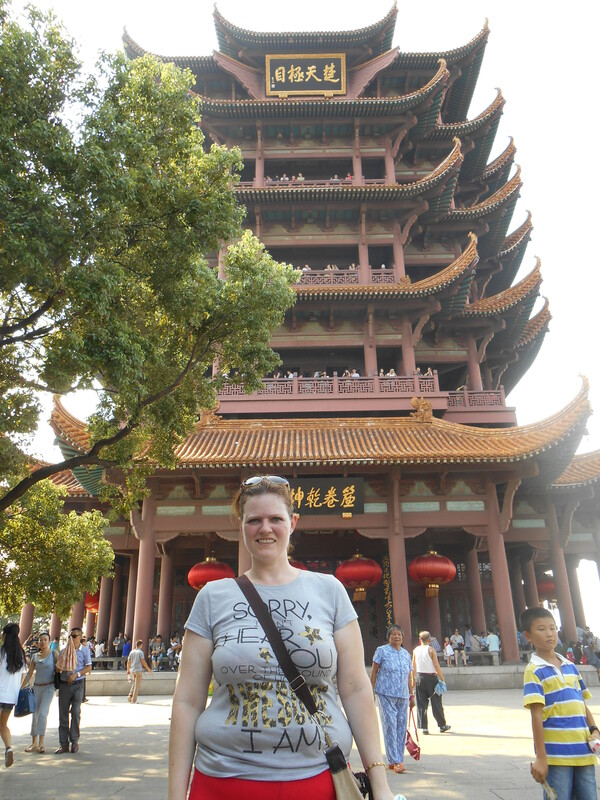 Next on the list was the Yellow Crane Tower. According to legend the tower was originally built by an old pothouse owner named Old Xin. His son was very kind to a poor Taoist priest that came by that way and offered him wine, asking nothing in return. As a thank you for his kindness the priest painting a crane on the wall that would dance whenever the son commanded. As a result the family became fabulously wealthy and built the Yellow Crane Tower. Since then the tower has burned down many times and the current one was rebuilt in 1981, which was a little disappointing to realize that the ancient tower is only a year older than me. It was very beautiful though and offered a great view of the Yangtze River. I also got to see a Buddhist and Taoist temple. I can’t really remember which was which but one of them -Taoist I think had huge incense sticks burning out front and several temples including one to pray at if you wanted to become rich and one to pray at if you wanted to have a baby. I saw several priests in long white outfits and hair in a tight topknot on their heads. Also while we were there two men got into a fist-fight and one guy started punching the other in the face. It was not cool. Then again, this is China. For dinner we went down to the riverfront to a food street where I got my first whiff of stinky tofu. It smelled like a combination of wet sneakers and vomit mixed together, but apparently people around here like it because the line was super long to get it. I however, was not brave enough to try it. There were lots of fair foods like cotton candy, fried bananas, and octopus on a stick. Also the Chinese sometimes eat healthier sweets so many of the kids were walking around with fruit kabobs for candy. 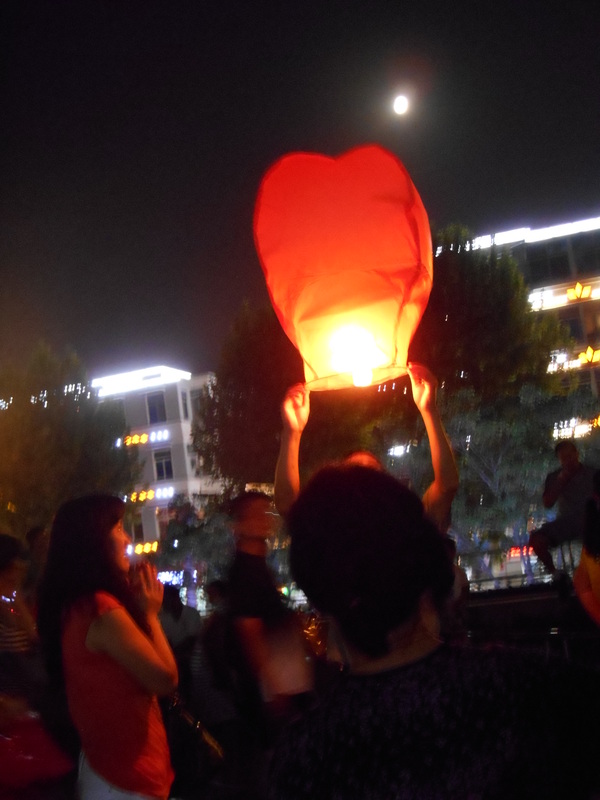 In the evening I got to see the Chinese lanterns being lit and carried away in the breeze. It was so peaceful and graceful to see them float off. According to tradition, you are supposed to write your wish on a lantern then light it and let it drift off over the river. I couldn’t help wondering though if this was not a giant fire hazard, especially after one Chinese guy dropped the fuel out of his and had to stomp on it to avoid causing a fire. All in all it was a pretty great day. I wish you all a Happy and Safe Mid-Autumn Festival. Until next time – I send my love. The lanterns sound so peaceful!! Thanks for the tour and all the tidbits of history! It looks like a wonderful day! The kids and I will do a unit study on China this year to place ourselves in your world for a while;). We are doing great and having a fun time with being home together. The kids are both playing soccer and the weather has Ben great. I need to be walking the dogs more before it gets cool. How’s Patches doing?! I think you are right to steer clear of that tofu! That’s just a little too far haha!! Love & hugs! I’m so excited that the kids will do a unit on China. Let me know and we can do a skype date. If you let me know in advance I might even be able to get a chinese student to talk with them and answer questions about China. if you have time, you can go to Hubei Province Museum, it is free and very big with many interesting historical and cultural relic in it. The lanturns were so pretty and graceful floating up in the night sky. I took a couple pictures of the sky but they didn’t do justice to the beauty of the night. Also I got to hear folk music and people dancing in the park. My friends were not impressed, they said that’s where the old ladies went to excercize but to me it was really neat. I wanted to stop and listen to the music and dance around a bit but we were on the way to the night market and back to the car so I didnt get to. It was one of the neatest nights I’ve had since I arrived in Wuhan. Those are some really neat looking buildings. I’d love to see the Chinese lanterns floating peacefully in the night sky over the water. It must have been an amazing sight. I just love your picture tours. Thank you for sharing. Luv you bunches! Talk to you soon!